Arab League monitors are visiting three more troubled Syrian cities to check if government forces are complying with a peace plan. The observers, split into teams of about 10, travelled to Hama, Idlib and Deraa, where anti-government protesters continue to clash with security forces. Unconfirmed reports say violence has broken out in the Damascus suburb of Douma, also being visited by monitors. The observers earlier visited Homs - a focal point of the unrest. The team's leader caused controversy by saying he had seen "nothing frightening" on his visit there. Sudanese General Mustafa al-Dabi later said he needed more time to make an assessment of the city. During their visit to Homs, the observers were mobbed by anti-government protesters demanding protection. Correspondents say they are likely to encounter similar scenes on Thursday when they visit Deraa, Hama and Idlib on the third day of their mission. The London-based Syrian Observatory for Human Rights told AFP agency that at least two protesters had been shot dead in Douma "as Arab observers arrived at the city hall". 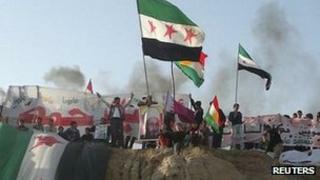 Protesters in Hama - north of Homs - have tried for two days to stage demonstrations in the city centre, only to be dispersed by security forces firing tear gas and live ammunition, reports say. An activist there, Manhal Abo Baker, told the BBC's World Today programme that it was almost impossible to speak to the observers without the authorities knowing. "We can't communicate with the inspectors. The inspectors are watched all the time by the regime thugs and the shabiha (militia)," he said. "If they saw me and saw that I was talking to them... they would run after me and if I was caught I would be dead for sure." Another activist, Abu Hisham, said people were going down into the streets of Hama to await the delegation, Reuters reported. Security was heavy and marksmen were seen on rooftops, witnesses said. Violence is also reported to be continuing in Idlib. In Deraa on Tuesday, rebels shot at an army convoy killing four soldiers. Although the uprising against President Bashar al-Assad began with peaceful demonstrations, many army deserters and civilians have since taken up arms against the government. The BBC's Jim Muir, in neighbouring Lebanon, says observers are coming under criticism from activists for not being outspoken enough and for being dependent on the government for transport and security. He says the Arab League is under strong pressure to produce decisive results. Activists said nearly 40 people died during the first two days of the observers' mission. Casualty figures and other information are hard to verify as most foreign media are barred from Syria. Gen Dabi has defended the Arab League mission, saying it is still in its early days. The US has also urged activists to give Gen Dabi and his team a chance. China, a key Syrian ally, said on Thursday it welcomed the observers' "objective investigations". A foreign ministry spokesman said China hoped all parties could work towards "the proper settlement of Syria's crisis", Xinhua news agency reported. The mission currently consists of 66 observers and is expected to rise to between 200 and 300. It is to assess an initiative - agreed with Damascus after weeks of prevarication - requiring all armed forces to withdraw from areas of conflict. Damascus has pledged to allow the monitors full freedom of movement. On Wednesday, Syria released 755 people detained during the uprising. State TV said their "hands were not stained with blood". President Assad says government forces are fighting armed gangs and that more than 2,000 security personnel have been killed.